The Supernanny delivers a guidebook to aid parents with rambunctious toddlers. 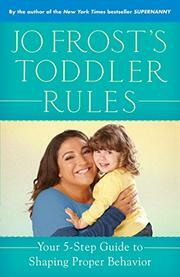 With more than two decades of experience as a London nanny, Frost (Jo Frost’s Confident Baby Care, 2008, etc.) has seen just about every kind of behavioral issue a young child can produce and has developed certain strategies that effectively nip bad behavior in the bud. She offers parents of preschoolers and older children five basic guidelines to follow to ensure a child grows "into a happy, healthy, productive adult with good morals, healthy boundaries, and the ability to function well in the world." By meeting the physical, nutritional and sleep needs of a child, as well as providing an environment that encourages brain development and setting clear rules for family behavior, parents can eliminate most, if not all, potential problems. Using a method called SOS, Frost recommends a parent Step back from the situation at hand, Observe what is happening, and then Step in and administer the appropriate resolution. Using clear-cut examples that are common issues with young children, the author provides parents with ready-made solutions that have proven effective, eliminating the need to second-guess a decision. She covers sleeping problems (getting a child to sleep in his own bed or what to do when he cries in the night), food and eating issues (refusing to eat certain foods, establishing good table manners, going out in public with toddlers), the need for safety and interacting with other children. She also suggests activities to stimulate gross and fine motor skills and recommends basic good behavior rules that are the accepted norms for human interaction. A full chapter devoted to handling temper tantrums is an added bonus for parents in crisis mode. Common-sense and practical advice on raising young children by an expert in the field.